Restoration and repair is a highly skilled job. We provide the highest quality service and use only the best materials. From minor resin repairs, missing putty and broken panes of glass, to larger scale splices and replacement. Our craftsmen are able to return your sash windows to their former glory. In some cases new sash windows may be required, we can also supply these to exactly match the existing style. 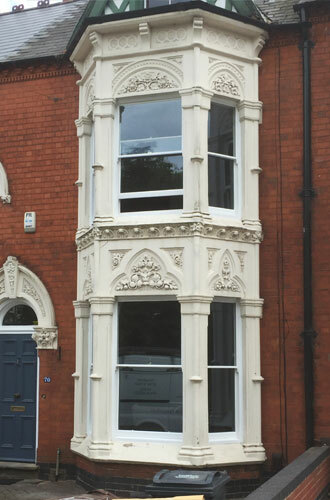 We always endeavour to retain as much of the original window as possible, this policy is in line with local conservation and listed building requirements. Strip away rotten frame Replace with hardwood As good as new! ● Evaluate the condition of the window sill and frame. ● Stripping down excess or loose paint and carry out repairs as required. ● Fit concealed draft proofing system. ● Repair opening casements and doors. ● Service hinges to enable easy and smooth opening. ● Fit any (new) window furniture. ● Replace any loose putty. ● Replace any broken or poorly fitted glass. ● Prime and prepare all visible woodwork where necessary for additional painting and decoration. ● Full and comprehensive painting service available.